“Regarding the angels, he says, “He sends his angels like the winds, his servants like flames of fire.” But to the Son he says, “Your throne, O God, endures forever and ever. 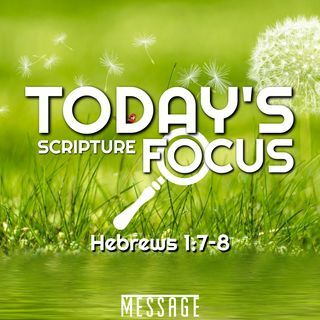 You rule with a scepter of justice.” ... See More (Hebrews 1:7–8, NLT). I don’t know about you, but I am tired of the injustice in this world. I am tired of murderers who should be incarcerated walking boldly like they are on vacation. I am tired of certain people groups receiving preferential treatment while others suffer. I am tired of the have and have nots disparity. I am tired of the sense of autonomy some public officials have; nevermind checks and balances. I am tired of laws that do not apply to all people regardless of any qualifying factor, across the board. If something in our society does not change for the better soon, we will self-destruct. I am not an alarmist, I am just saying sin, degradation, and injustice cannot continue to be embraced without natural and eternal consequences. I find courage in our theme text, because it agrees with one of my favorite visions in the book of Daniel, which prophesied the successive world empires from Babylon, to Medo-Persia, Grecia, Western Rome, the division of Western Rome, the Papacy, and the joint religio-political venture between the Papacy and the United States of America that is finally supplanted by the kingdom of God. Among the empires mentioned here, and the powers referenced in Daniel chapter 11, many stand up and then sit down. They stand up, oppress the nations, and must take a seat. They stand up, oppress the consciences of the nations, and must take a seat. They stand up, and in the arrogance of their power, they abuse privilege, and must take a seat. But, soon Jesus Christ will stand up, as in Daniel chapter 12, and the only seat He will take in that day is upon His throne of glory. Who is the King of Glory? The Lord, strong and mighty. Who is this King of Glory? The Lord, mighty in battle; He is the King of Glory. Jesus’ justice, authority, and kingdom will soon unseat every earthly power forever, like a massive stone grinds all inferior materials to powder. I am so glad that when He returns, it will be the beginning of everlasting justice and peace in the entire universe. Until then, give thanks for God’s love and the ministry of holy angels who will help guide us along the right path, along with the blessed Holy Spirit. Give thanks for the great news that soon every knee will bow, and every mouth will confess that Jesus Christ is Lord, to the glory of God, our Father.